For some people, the laundry room is essentially a storage closet. For others, it’s nothing more than a washer shoved into a corner of the kitchen or garage. No mater where your washer is located, we spend more time than we’d like doing laundry, and it’s easy for the mess to get out of control. Ready for a more organized laundry room? It’s project time. Clear the way. Before any home project, the first step is to clear away the clutter. In the laundry room, that may mean bottles of half-used detergent, stacks of magazines, and piles of clothes that never made it to the dry cleaners. Assess the mess. Is your folding table a catch-all for baseball hats and beach towels? Do you trip over flip-flops every time you do laundry? Instead of fussing at the kids (again) for making a mess, work with the space you have. If your kids drop pool toys on the floor when they get home, label a basket “summer toys” and set it in the corner. Put a laundry bin in the corner for towels, muddy t-shirts, and other discarded items that always make a mess. Get organized. Nobody likes staring at lime-green plastic. Store detergents, fabric softeners, and dryer sheets in fabric bins on a shelf above the washer. Not only will it limit your mess, you’ll be able to bring a little brightness to one of your least favorite chore rooms. Go vertical. Drying racks are all well and good, but the easiest way to organize line-dry laundry items is to hang them. Install a closet rod for easy hanging or, if you’re feeling rustic-chic, hang a retractable washing line and a small basket for clothespins. Assess your accessories. 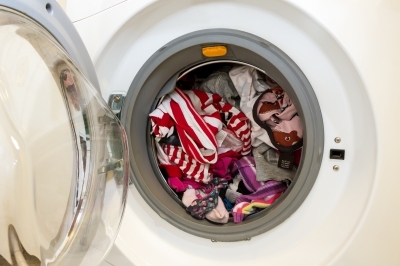 Is your laundry room overflowing because it takes two rounds to get the soap out of your clothes? A new washing machine may be in order. Make sure your washer and dryer are efficient (and won’t cause any flooding or fires when you leave the laundry running and zip to the store). Mr. Junk is here to help you take control of your home spaces. Call our Alpharetta junk removal service to haul washing machines, dryers, and laundry bags of clutter.